"Sampath Speaking" - the thoughts of an Insurer from Thiruvallikkeni: MV Act ~ road rules ....... and driving without licence !!! MV Act ~ road rules ....... and driving without licence !!! In legal Forums, and Court of law, many legal aspects do get analysed in every case. In the impugned case, the learned counsel for the respondents submitted that the person holding LMV is not entitled to drive the transport vehicle if there is no endorsement on his driving licence to that effect under Section 3(1) of the Motor Vehicles Act from the District Transport Officer. "3. Necessity for driving licence.-(1) No person shall drive a motor vehicle in any public place unless he holds an effective driving licence issued to him authorising him to drive the vehicle; and no person shall so drive a transport vehicle [other than[a motor cab or motor cycle] hired for his own use or rented under any scheme made under sub-section (2) of section 75] unless his driving licence specifically entitles him so to do." In the instant case, the Mini Door 3 Wheeler of the appellant was certainly a transport vehicle as defined in Section 2(47) of the Motor Vehicles Act and, therefore, the endorsement on the driving licence of its driver under Section 3(1) of the Motor Vehicles Act was essential. Without this endorsement, therefore, it can be safely concluded that the driver was not holding a valid driving licence and that the respondents are not liable to pay insurance claim to the appellant. That was the decision highlighting ‘what constitutes valid license’ decided by - State Consumer Disputes Redressal Commission [SCDRC] Punjab in - Asha Rani vs UIICin Sept. 2010. The roads are getting congested – and the way people drive mad, it would appear that only a small proportion are sane…. as you drive in the metropolis – there are killer lorries [water tankers are notorious]; transport corporation buses threaten you; it is so scary riding infront of tourist taxis, buses of educational institutions and those transporting office goers……….then there are fantastic costly cars whose owners decide that they only are entitled to be on road and drive at breakneck speed – as you feel threatened of your existence, an autorickshaw cuts past from nowhere…… and then there are two-wheeler (many do not look road-worthy but still transport sometimes a group of people)……… there are also cycle rickshaws and the odd bullockcarts – with many cattle [cows / buffaloes / horses] roaming on the street not to speak of the population of stray dogs…. Why do people drive so fast and negligently – is it sheer fun; is that because of the power of vehicles that thrusts the macho feeling… women on wheel is more dangerous…..What we fail to learn is : As a Nation, we are not law-abiding. We would stretch every muscle to break the rules. Most rules be it traffic rules, signals or other laws are meant to bemuse and restrain the common man. People ride with gay abandon on wrong side and on roads declared as one-ways. The rich and powerful always consider themselves above the law. 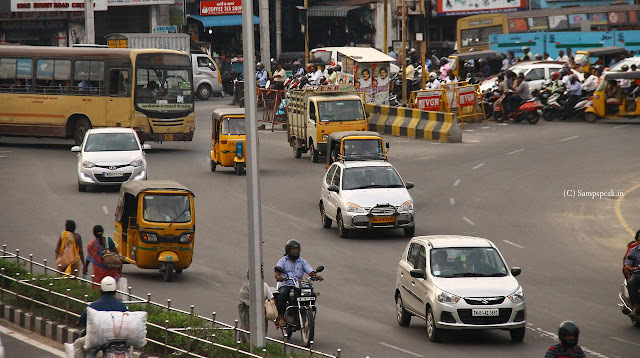 In the busy stretch of KamarjarSalai (Beach Road) in Chennai, where traffic flows right from the morning, one can often see vehicles violating signals, cutting yellow lines and being driven at break-neck speeds causing trouble, fear, hindrance, nuisance and threat to life and limbs of other road users. Many of them belong to Politically powerful (one can see the stickers and paintings of political leaders), some Government vehicles, transport corporation buses and top bureaucrats – many of them even have the red light atop the vehicle. If it is a rule, does it differentiate between elite and ordinary road users. Sometimes, even life saving ambulances are not properly provided free way. Worst, whenever an ambulance winds its way through marauding traffic, people mindlessly try to follow the ambulance by driving fast after that. But would you drive or allow your son to drive without a valid Driving Licence ?is that not an offence ?? ~ now read this newsitem in today’s Times of India, Chennai edition titled ‘ TNSTC permits over 30 of its drivers to operate buses without valid licence’ – shocking !! At a time when carrying original driving licence is mandatory for drivers, Tamil Nadu State Transport Corporation (TNSTC) has allowed more than 30 of its drivers to operate buses without a valid licence in one case for over six years.The issue came to light when advocate brought the matter to the notice of the Madras high court. Admitting his plea, Justice T Raja has ordered notice to TNSTC returnable by October 26. Williams submitted that the driving licence of P Natarajan, a driver with TNSTC, had expired in 2011. Since he had crossed 40 years of age, his licence could not be renewed automatically, as rules mandate his personal appearance before the authorities and a test to prove his physical endurance.But, flouting the rules, Natarajan chose to drive without a valid licence, instead of renewing it. Being the regional secretary of Anna trade union, an affiliate of the ruling AIADMK, Natrajan managed to keep TNSTC officials from bothering him to renew the licence. Natarajan was doing so for the past six years, knowing well that his act was not only illegal but also puts hundreds of innocent passengers' lives at stake. Appalled over the inaction of TNSTC over the issue, Williams approached the high court. He further submitted that knowing that the issue has reached the court, on September 2 TNSTC passed an order stating that action had been taken against two supervisors who failed to supervise the licence issue. Natarajan has renewed his licence now. This apart, through another order passed by the corporation on August 25, it has come to light that 31 more drivers conductors have not renewed their licences and were allowed to continue their work with expired licence, the advocate said.